One of Studs Terkel’s most important oral histories, Will the Circle Be Unbroken? turns to the ultimate human experience—that of death. Called “extraordinary . . .
a work of insight, wisdom, and freshness” by the Seattle Times when it was first published fifteen years ago, the book explores—with unrivaled compassion and wisdom—the indelible reactions to mortality and the experience of death and the possibility of life afterward. Here, with memorable grace and poignancy, a wide variety of people addresses the unknowable culmination of our lives and its impact on the way we live. Included in this remarkable treasury of oral history are Terkel’s interviews with such famed figures as Kurt Vonnegut and Ira Glass as well as with a range of ordinary people, from policemen and firefighters to emergency health workers and nurses, who confront death in their everyday lives. Whether with a Hiroshima survivor or an AIDS caseworker, a death-row parolee or a woman who emerged from a two-year coma, these interviews offer tremendous eloquence as they deal with a topic many are reluctant to discuss openly and freely. Rich, moving, and inspiring, Will the Circle Be Unbroken? 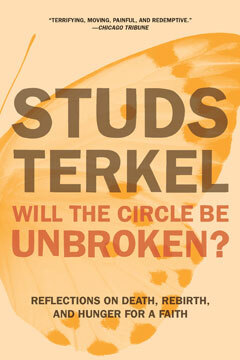 is a stunning capstone to Terkel’s extraordinary career.